The undead aren’t their only problem, though. There’s Gloth, a cowardly yet savage wolf that has the ability to talk through his seemingly endless rows of razor sharp teeth. Gloth patrols the land, looking for easy prey. He and Broxo have a history, and as you might expect, their paths are destined to meet again very soon. Then there’s Ulith, a mysterious witch who has the ability to observe Zora & Broxo from afar with the help of her animal servants. Giallongo does a good job keeping the reader guessing what Ulith’s relationship to Broxo and her role in Zora’s quest is until nearer the end, with satisfying results. Broxo is a graphic novel that sticks in your brain, it’s like snorting super glue. Actually, it’s nothing like snorting glue. In fact, do NOT snort super glue, ever. 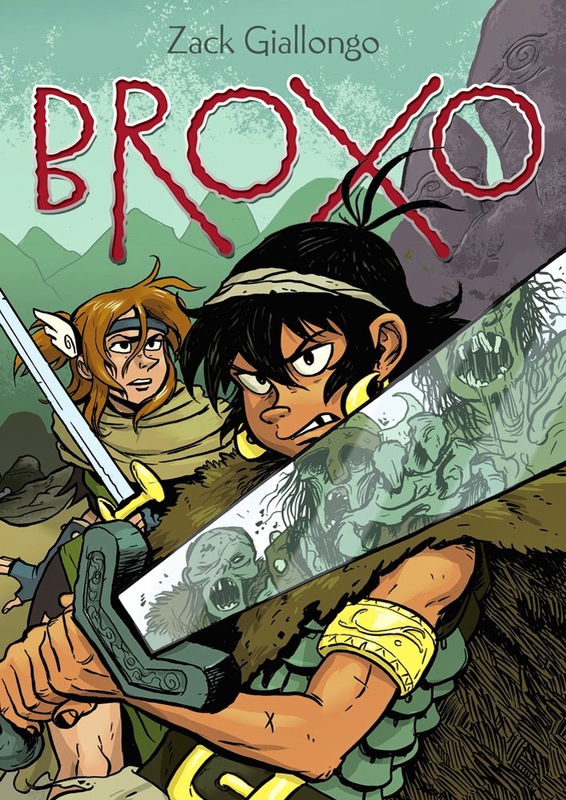 What I’m trying to say is that Broxo is awesome, Giallongo has created a rich, loveable cast of characters in a world you want to spend a lot more time in, even if the food is bad. I’d recommend this graphic novel to anyone aged twelve and up. I really loved this one. There's nothing too different in it, but it reads so well.